This luxury red cardboard round and short tube box with gold stamping, at first blink of view, shows how well-made the product inside is and gives a special attraction of customers. The material used is eco-friendly 250g cardboard paper with red leather paper with fine motifs on the surface, which makes it look like made by leather. The color is very eye-attracting while the technic of fabrication is exquisite. 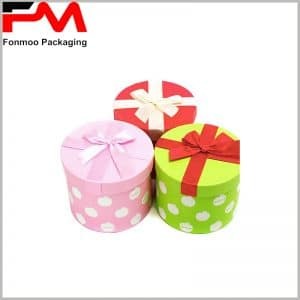 It is designed to be package for cosmetic goods, such as cream, powder, or some special little products with high value that can be served as gifts. You can also use it as jewel package, with optional interior add-ons like eva sponge or velour. At last, the printing on the surface is made by gold stamping to give luxury golden patterns. If this box is just what you need, don’t hesitate to get in touch with us to communicate the details of your demand. Our professional team is here for your service. 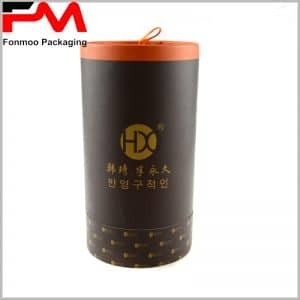 As manufacturer, we can offer you good price and quick reaction, as well as very flexible conditions of purchasing, to let you have your ideal luxury cardboard round tube box with gold stamping.